If you haven't noticed, I've been on a mission over the past few months to seize opportunities, live more in the moment and take up new challenges. My 'wish list' of things to tackle grew longer and all I could manage to do was talk about the changes I wanted to see. Talk doesn't seem to get you very far these days so I've been diving into new experiences, signing up for classes, reading books that have sat on the shelf for months and generally putting myself out there. The result? Well, I'm certainly busier but I've also welcomed new people and opportunities into my life and I hope to continue down this path. 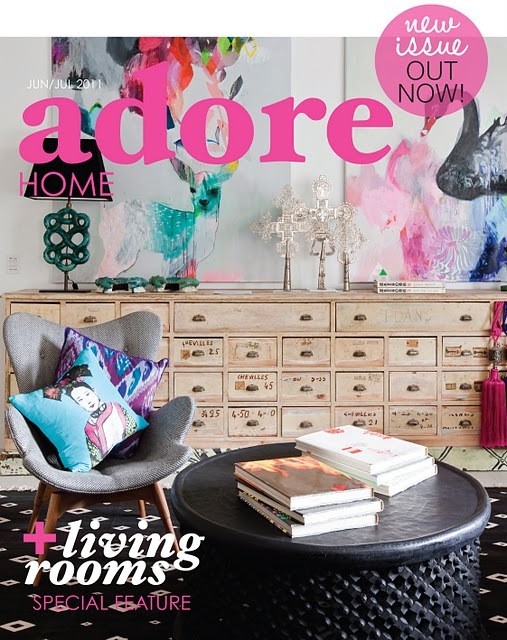 When the new issue of Adore Home magazine launched today I felt a sense of excitement as I know how hard Loni Parker has worked to put this issue together and the end result looks great. I'm also a little bit biased because going forward I'm excited to let you know that I'll be helping out the Adore Home team! I'll be juggling this new project in addition to my day job and the millions of other projects I've got going on. Life will remain busy but I guess that's just the way i like it.